With the new TrueVIS VG Series, we didn’t just make a few upgrades to our print/cut technology - we reimagined everything. New Roland DG FlexFire print heads that deliver beautiful prints more efficiently. 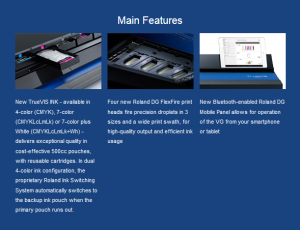 New inks that are more vibrant and cost-effective. New cutting technology that increases accuracy. New tech to communicate with your existing phones and tablets. And so much more. The future of print/cut has arrived. 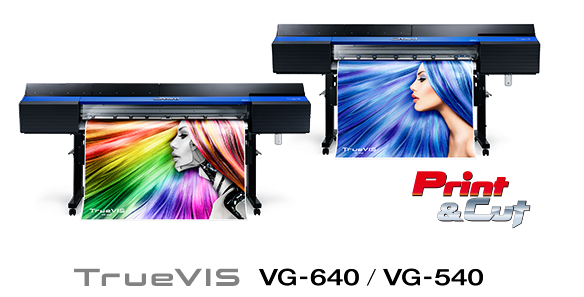 Available in 64-inch and 54-inch models, TrueVIS VG Series inkjet printer/cutters are designed with your end results in mind. Dynamic decals and labels. Brilliant banners. Striking signs. Vibrant vehicle graphics. Powerful posters. Because we know you need to be able to produce it all – on demand. More efficiently and productively than ever. With TrueVIS, your vision for maximum versatility and profitability is now a reality.